Sixty-year-old Hussain Ansari, who has been an autorickshaw driver for the past 40 years in Junagadh city, feels that if the Bharatiya Janata Party (BJP) has hopes of winning from the Junagadh Lok Sabha constituency, it needs to do much more than simply work up sentiments by describing the territory as one that had been on the verge of joining Pakistan during independence. Modi, while launching the BJP’s Lok Sabha election campaign from Junagadh on April 10, recounted Sardar Vallabhbhai Patel’s contribution in ensuring that Junagadh remained with India, and asked “Can anyone in Junagadh forget Sardar Patel?… If Sardar was not around where would Junagadh be?” The audience replied in unison, “In Pakistan”. Ansari is not the only voice that speaks of dissatisfaction in the constituency where Congress performed impressively in the 2017 state Assembly polls, winning all six seats. However, Kanu Solanki, a driver says it will be a close fight between the two major parties. “Both Congress and BJP do not keep their promises,” he said. Speaking about the lack of job opportunities, he said, “There are only a few industries scattered in the region and the only earnings we get is due to Girnar where festivities are held during Shivratri and Parikrama.” Solanki said the widespread unemployment among youth of the region had led to them drive autorickshaws for tourists in order to make ends meet. The constituency comprises the Gir forest, home of the Asiatic lion, a major tourist attraction, and is famous for the Kesar mangoes grown in Talala region. 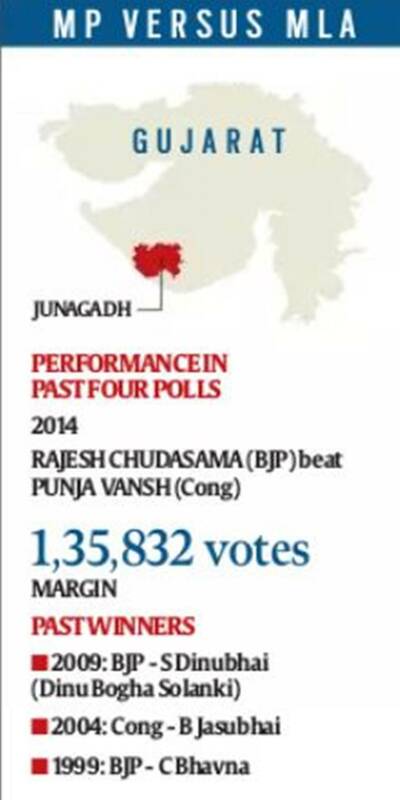 Somnath and Junagadh districts – the BJP has been winning the Junagadh Lok Sabha seat since 1991. The only time Congress won was in 2004 when BJP’s “India Shining” Campaign failed to yield results. This time, sitting BJP MLA Rajesh Chudasama will be taking on sitting Congress MLA from Una, Punja Vansh. The first time Chudasama clashed with Congress veteran Punja Vansh was in 2014 elections when the 36-year-old BJP candidate won by a margin of 1.3 lakh votes. Sitting MP Rajesh Chudasama too expressed confidence that he would win the Junagadh seat. “The Congress victory two years ago is history. The mood of the people has changed. They want to not only vote for the BJP, but also want to see Narendra Modi being re-elected as the Prime Minister,” said Chudasama, speaking to The Indian Express over the phone. What the BJP sees as working in its favour are precisely the things that the Congress says the voters are unhappy with. “The main issues this time will be about how BJP’s promises of 2014 have remained on paper,” Congress candidate Punja Vansh said. “Be it their promises to youth or farmers, nothing has been fulfilled. Just today (April 13) the BJP put up a hoarding of the Girnar ropeway project for which they had laid the foundation stone 15 years ago and the project remains incomplete,” he pointed out. Meanwhile, the Supreme Court recently stayed the bypoll to the Talala Assembly seat, after erstwhile Congress MLA Bhaga Barad challenged the Election Commission’s announcement of the bypoll within days of his disqualification from the Assembly following his conviction in a 24-year-old case of illegally mining limestone.